Since becoming a new mum, a new 'working’ mum I must add, time has become a big topic. I have to carefully plan my day to fit in the most important of tasks as inevitably, there will be some things that just won’t get done. I find myself writing lists in order to tick off what needs doing throughout the day or to simply remember what needs doing for the day amongst the many other things going round in my head. I still find time to bake a cake though! (ohh yes, there’s always time for that). But every now and then I delegate some shopping chores to our friend – the internet – ordering and getting stuff delivered is a great help. I haven’t quite moved to the realms of ordering groceries online though, but what I do order, is my baking stuff. The lovely people at www.cakedecoratingstore.co.uk sent me this Cake Tester and a Decorating Turntable. I do wish I had gotten the turntable sooner (especially when baking this), its table rotates very smoothly and I can reach all sides of a cake with minimal effort. It’s also lightweight but sturdy at the same time, making it ideal for my more heavier cakes. 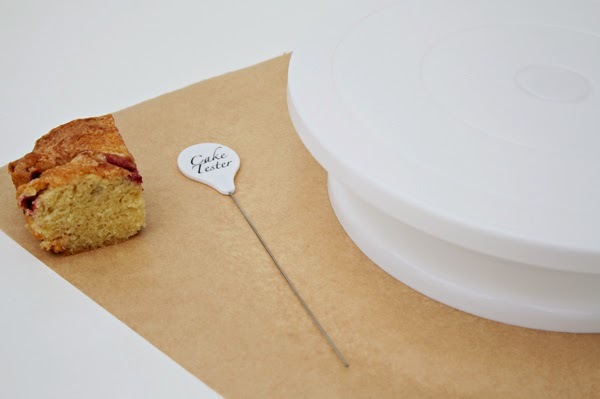 The Cake Tester has quite a thin prong and could probably do with being a bit thicker in width to get a better indication of cake consistency, but its super-slim nature would make it ideal for testing delicate cupcakes. I look forward to using the turntable table again especially for fondant icing jobs; and glad to have discovered www.cakedecoratingstore.co.uk for future bakeware supplies. More items for the kit.